It’s a holiday tradition. Parents haul their kids off to the mall so they can take their picture with Santa Claus. Rest easy, the big guy is not the subject of the latest celebrity harassment claim! 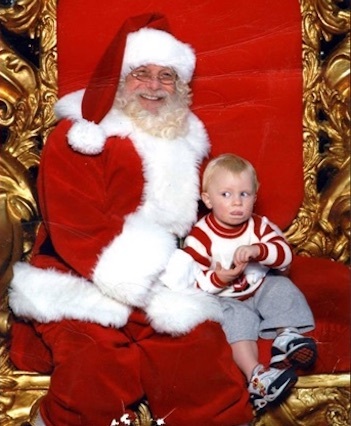 But for some unknown reason, this toddler was not having any of his sit down with Santa. In fact, according to his mom, Kerry Spencer, he was signing for help. “We taught our baby sign language. This is the sign for “help,” she tweeted. The photo has captured so much attention, she shares it on Facebook every year. Her son, Samuel Spencer, is 13 now, but was just a 1-year-old when the photo was taken at Provo Town Center Mall in Provo, UT. The Spencer family has since moved to Parkton, Maryland. This year, Spencer’s friend, Author Mette Harrison, told her to tweet it, so she could retweet it. Now, the post has more than 6,000 retweets and 24,000 likes. Several Twitter users said it didn’t look like the toddler was signing for help, but Spencer said it was just a different variation of the ASL sign. “It’s ASL baby sign, so he is slightly “mispronouncing” the word, but it is the sign he always made when he needed help,” she wrote in a response on Twitter. For comparison, she even tweeted the proper way to sign help. Spencer said she taught both her kids baby sign because they can sign before they talk and it is so very useful to be able to communicate with your baby.